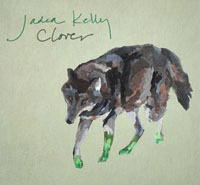 Share the post "Album review: JADEA KELLY – Clover"
Jadea (pronounced Jay-da) Kelly is an emerging Canadian artist whose 2010 independently released Eastbound Platform album saw her nominated for ‘new emerging artist’ in the Canadian Folk Music Awards. And believe me, there’s some fierce competition in that category. But back on home soil, at least, she’s perhaps best known for her vocal and recording work with such diverse acts as Canadian folk artist Catherine MacLellan and metal rockers Protest The Hero (Kezia, 2005, and Scurrilous, 2011). However, her latest offering – recorded at the Woodhead Studio in Toronto, in analog to 2-inch tape by producer Stew Crookes – sees a very significant shift in musical emphasis; ambient guitars, melancholy organ pads and orchestrated string arrangements combined with an aching vocal deliver. The result is a musical marriage of Lana Del Rey and The Cardigans Nina Persson, with the odd hint of Marcella Detroit. It may not have the sweeping iconic 1950′s lyrical imagery of Del Rey, but that’s compensated by the accompaniment the almost indie folk infused style of pop that The Cardigans perfected. This entry was posted in ALBUM REVIEWS, ALBUM REVIEWS (Mobile), All Posts and tagged album, Canadian, Clover, Jadea Kelly, review, singer, songwriter. Bookmark the permalink.